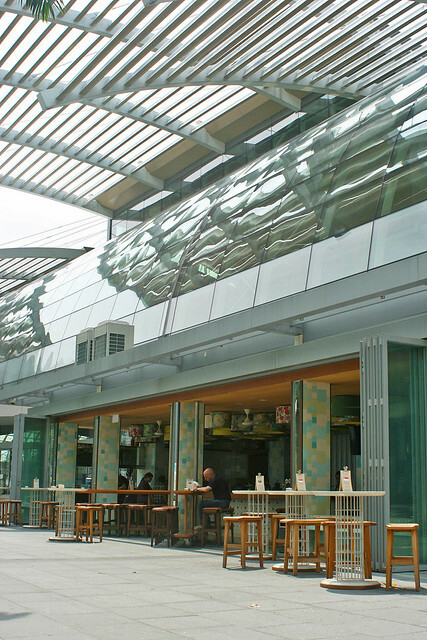 Marina Bay Sands now has more casual dining options. Eight waterfront dining outlets are opening along the entire bay-facing perimeter of the Shoppes. One of these is South Coast, an Australian-styled bistro and bar offering some pretty nifty eats. It's by the folks who started Boomarang (which has been sold off) and they take great pride in sourcing as much of their produce as possible from Australia and New Zealand. Almost everything is made inhouse - from bread to baked beans - so that they can control the quality of the food served. This hardworking bistro opens from 8am to 1am. In the morning, it's coffee, breakfast and a day menu, which is great for working folks needing to start the day right. A lot of fitness enthusiasts also pass along the waterfront area (jogging, biking, inline-skating), and they often stop here for a break. They have healthy fruit-and-grain breakfasts, eggs done various ways, freshly baked breads and muffins. South Coast even uses "Freedom Range Eggs" which are RSPCA approved to be chook-friendly. The eggs are tasty indeed. 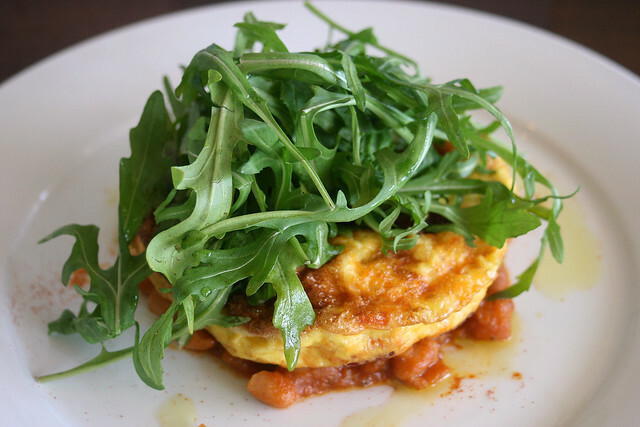 The baked omelette (S$21) features hefty chunks of chorizo, along with tomato, rocket, homemade baked beans with Turkish toast. There are various sides available like avocado, Roma tomatoes, streaky bacon, hash browns, sauteed baby spinach, beef sausage, and mushrooms. 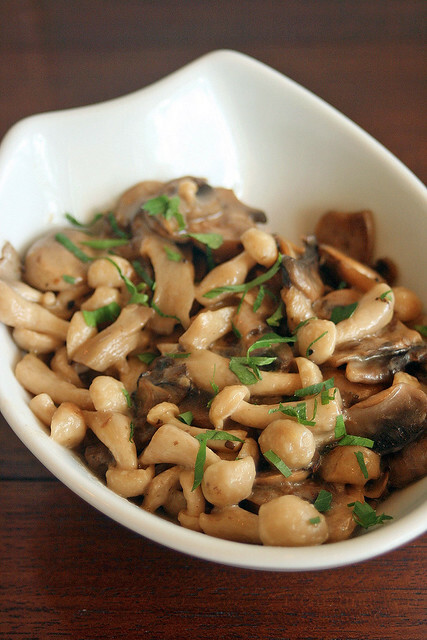 To their surprise, they found that Singaporeans are absolutely crazy about mushrooms (here with lemon and thyme, S$4). OK, I'm one of those guilty too, but I prefer mine very simply sauteed in butter with garlic. 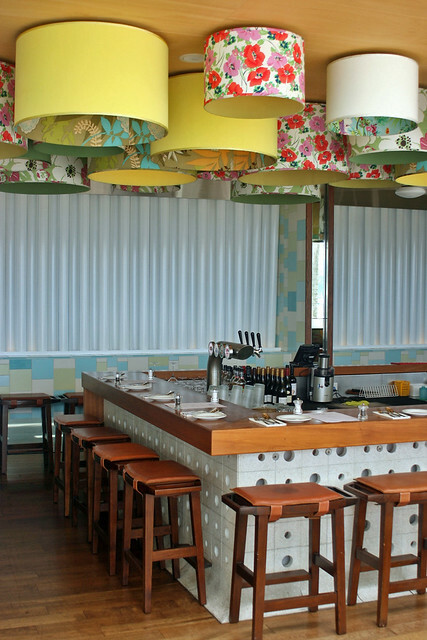 Later in the day, they switch to an evening menu comprising bar-tasting items for sharing, as well as pizzas. But if you must have breakfast for supper, just let them know, and they might be able to accommodate. 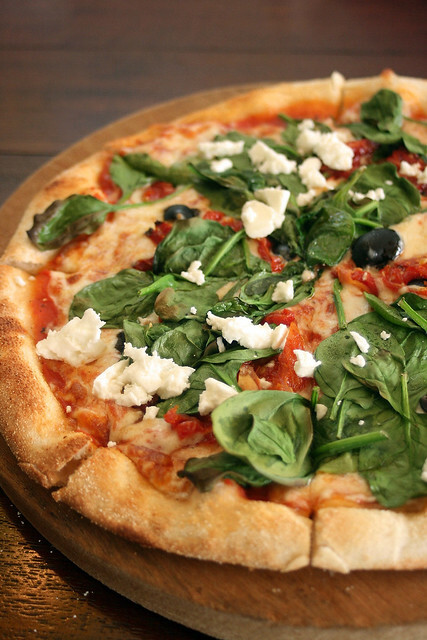 One of their signature pizzas - spinach, semi-dried tomatoes, olives and Persian feta (S$23). South Coast experimented quite a bit with the crust to get it right. Their final result is something gorgeously crisp, chewy and very satisfying. 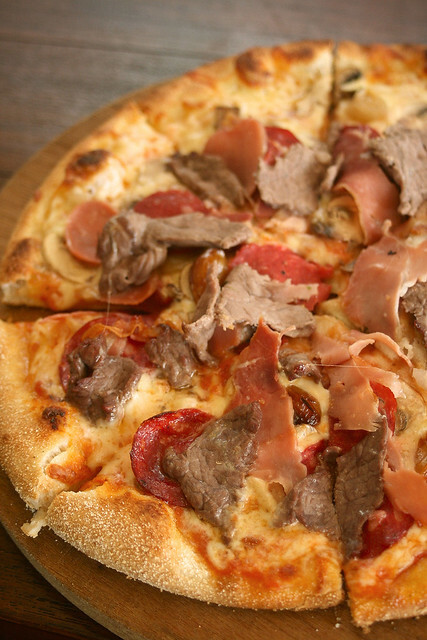 Pizza with wagyu, pepperoni, prosciutto, onion, mushrooms, cheese (S$25). Something for meat-lovers. This is the first time I've seen wagyu on a pizza. I'm really trying this out of curiosity to see how the wagyu fares. It does lend a light beefy fragrance, and is more tender than regular beef slices would be. Nice if you absolutely must have beef on your pizza. 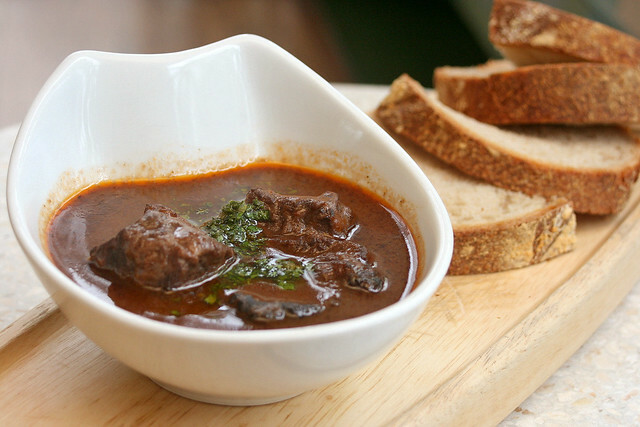 One of the bar-tasting items good for sharing is the Slow-Roasted Ox Cheeks (S$16) - gorgeously tender and flavourful chunks of beef cheeks in thick red wine reduction sauce. I was expecting this to cost a lot more. Mop it all up with the homemade sourdough bread (I'm loving the crisp crust on this too) that comes with all the bar-tasting dishes. There are full meals available too - beer battered barramundi and fries, wagyu burgers, grilled chicken salad, as well as vegetarian options. 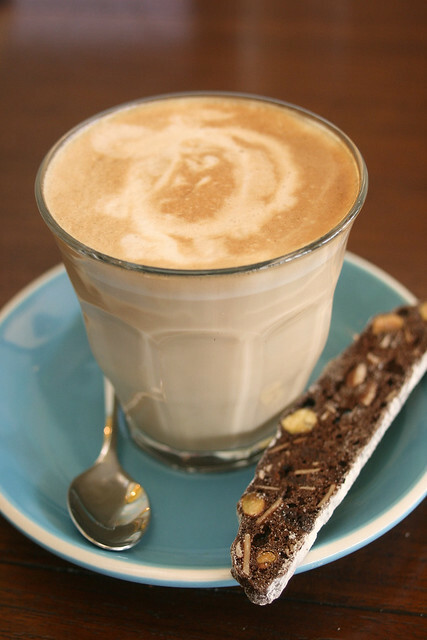 Don't miss the rich, aromatic coffee (Latte, S$5). Dragon from Australia, of course. 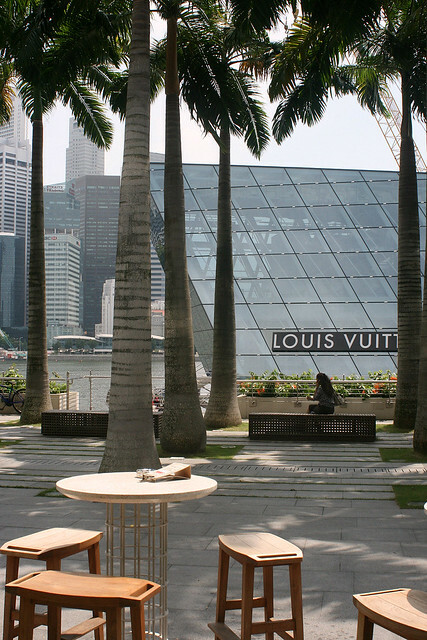 South Coast is situated along the Marina Bay Sands waterfront promenade right opposite the Louis Vuitton flagship store that's set to open Sep 2011. I can imagine how pretty the skyline must look during sunset too. The spacious waterfront area looks to be the new place to chill with friends after work, or have a quick meal before the theatre. So it was nice to discover that while this bar and bistro is at a high-rental place, the prices are set to please casual diners. And yet, they don't compromise on produce quality. You can check out the full menu (with prices) here. I'll be back to try some of the other items. Thanks to Marina Bay Sands for the invitation, and South Coast for the hospitality. I really like the place-it seems so fresh and cosy!And the food-oh my god that pizza is great. i had 1 of the worst dining experience at this restaurant, 2 weeks after your post, the menu changed, the staff were very rude. This was the 1st time in my life that i had to send back a dish. Kenny: yes, the pizzas were good indeed. Foodie: oh dear, thanks for the feedback.